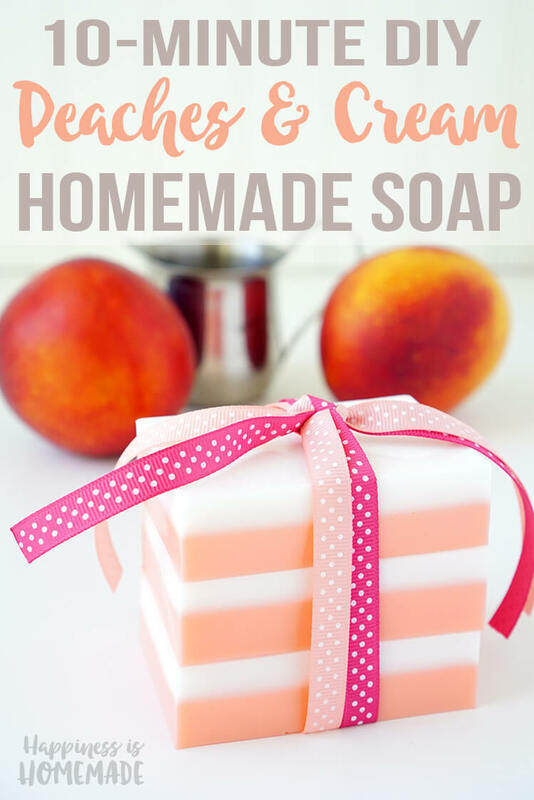 This Peaches and Cream Soap smells incredible, and you can whip up a batch in just a few minutes! Makes a great DIY homemade holiday gift idea! Perfect for friends, family, neighbors, and teachers! Summer may be winding down in some parts of the country, but we’re still in the thick of things here in Nor Cal, and I’ve got summer fruit on my mind! 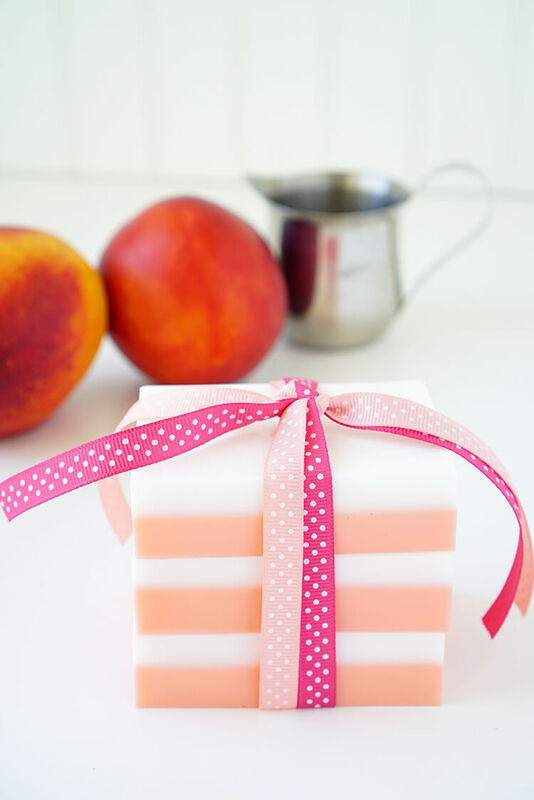 These peaches and cream soaps are super easy to make, and they smell beyond delicious! Over the years, I’ve made a lot of different soaps, but my family has declared that this one is the VERY BEST of them all! I made two different versions (layered and swirled) of my peaches and cream soap, and they both look great and smell divine! 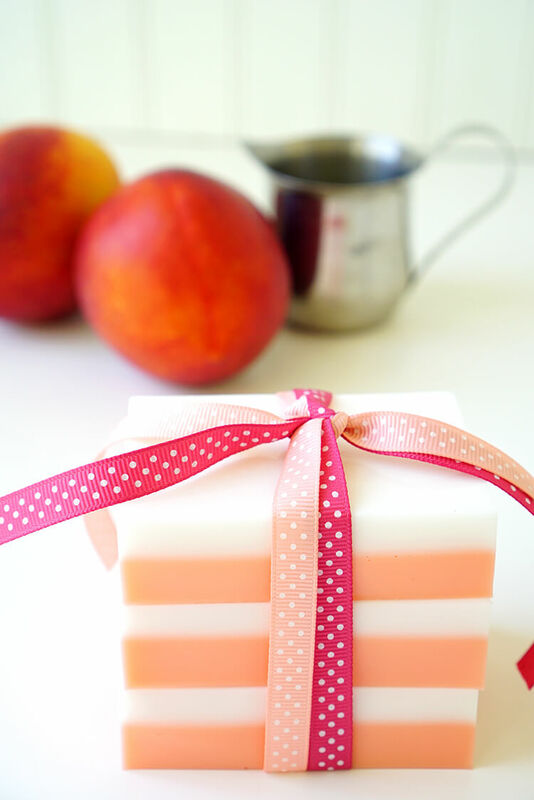 When the soap base is completely melted, add the peach soap colorant and peach fragrance oil (about 10 drops). 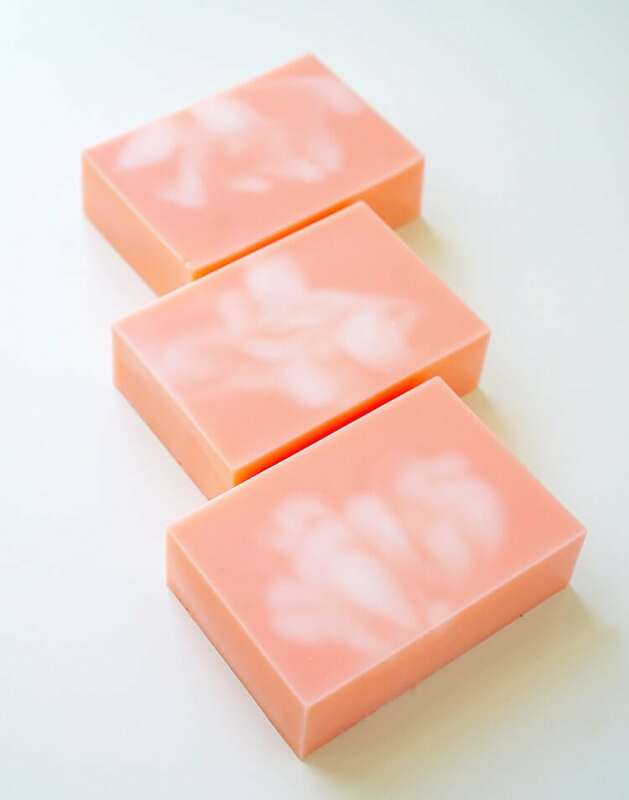 To make layered soap, fill half of the mold with peach colored soap, and allow it to cool and partially firm before repeating the process to create the white layer (omit the soap colorant this time). Allow the soap molds to sit undisturbed until completely cool (about 30-90 minutes depending on temperature/humidity). 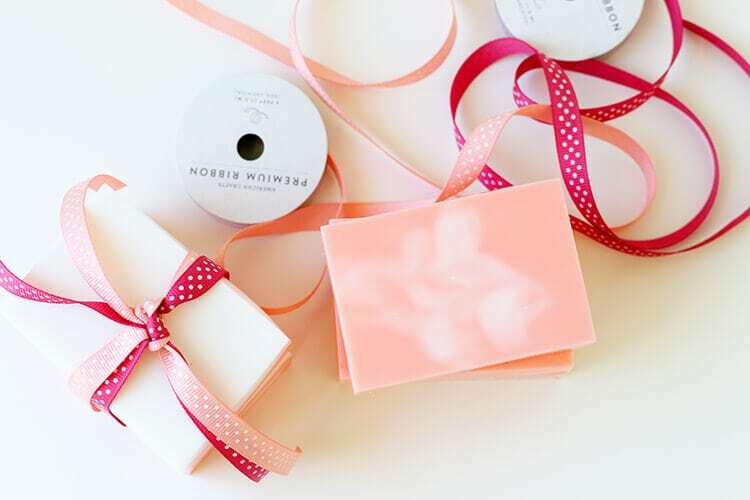 Wrap a bundle of soaps with pretty ribbons for an easy and inexpensive DIY gift idea! Goat’s milk soap is great for keeping skin healthy and moisturized, and it even boasts anti-aging properties thanks to its high Vitamin A and AHA content. Goat’s milk soap is gentle and mild and usually safe for people with sensitive skin or skin conditions such as eczema or psoriasis. The peach fragrance is definitely a family favorite, and my kids ask for this kind of soap every time now! I can’t blame them though – it’s my favorite scent now, too! 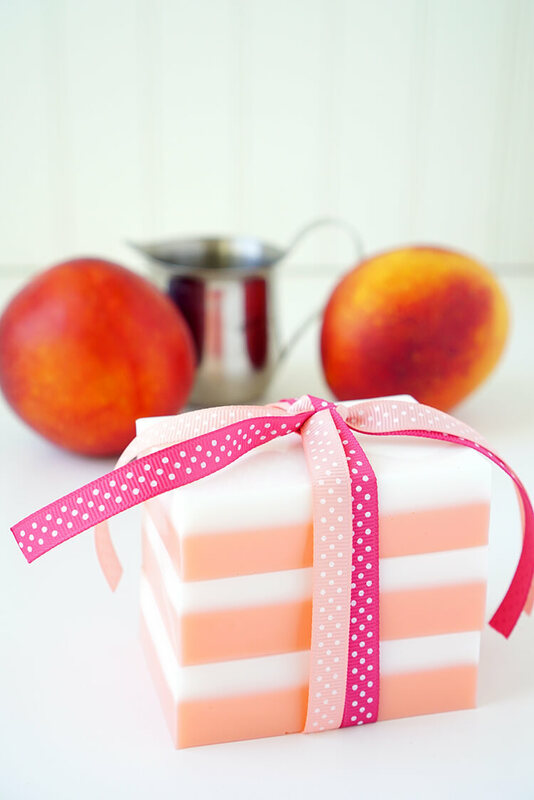 Whip up a batch of these cute peaches and cream soaps, and keep them on-hand for unexpected and last-minute gift giving! They’re perfect for birthdays and holiday gifts! « Easy Fall Kids Crafts That Anyone Can Make! How do you store your soap until you are ready to use it? what would you estimate the cost per bar to be? 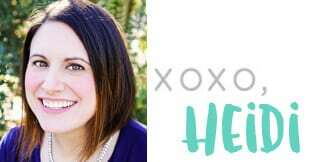 Hi Debra, the cost per bar will depend on if you have any of the materials on-hand or not (for example, once you have purchased a soap mold, you can use it forever). Starting brand new, I’d estimate the initial cost per bar to be around $2.50, but it will drop closer to $1.50 once you have the molds, fragrance oil, and other items that you can continue to re-use for quite awhile. You can also use your craft store coupons to get the cost even lower! Thanks for stopping by! I love the smell of peaches and cream, someone once bought me a peaches and cream car smelly and it was so delightful. How many drops of the colorant and how many drops of the fragrance? You mentioned 10 drops but I’m not sure if that’s a total between the two or separate. Do you use one lb per part or half a lb per part? Like if you’re doing the half white and half peach, do you use a half a lb for each part? Hi Heidi, This sounds like a great recipe. Is there any substitution for the goat’s milk base? My daughter is vegan and I’d like to make a soap similar to this as a Christmas gift. Thank you! I love this idea! Can these soaps be wet felted? Thanks for sharing this Heidi. It is timely because this year, I am making holiday gifts. I haven’t made soap before, so wish me luck! What is the shelve life of the soaps? My daughter is getting married in April and she is considering doing these as wedding favors. As long as you wrap the soaps in plastic wrap or in a plastic Ziploc bag, they will last a VERY long time! I don’t have an exact length of time, but I still have soaps that I made two years ago that look as good as new! With layered soap, however, you will find that over time the colors of the different layers can start to bleed into one another (in this case, they would just mix a bit so that the layers aren’t as clearly defined), so I would suggest making these no more than 3-4 weeks before the event. Hi there! 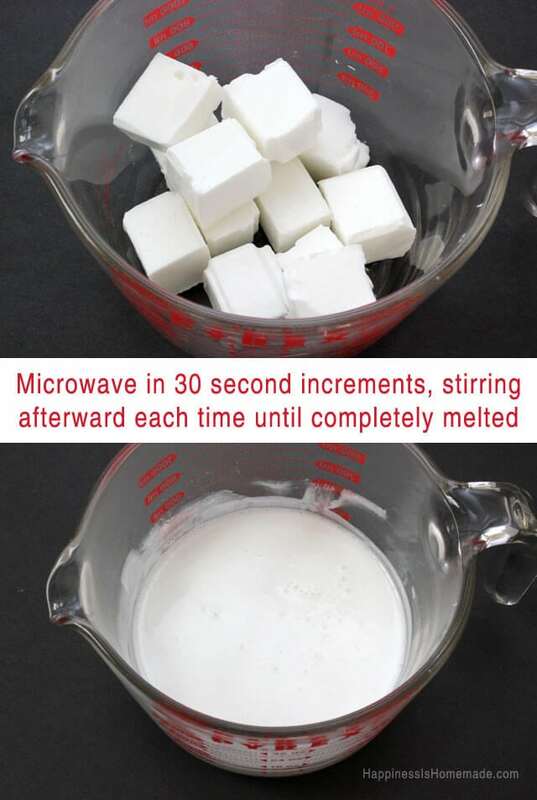 I am going to attempt to make these and don’t want to mess them up Lol. When you dump the first half in the mold, how long should you let sit until partially cool and hard before adding top layer? Thank you! Thanks for sharing! 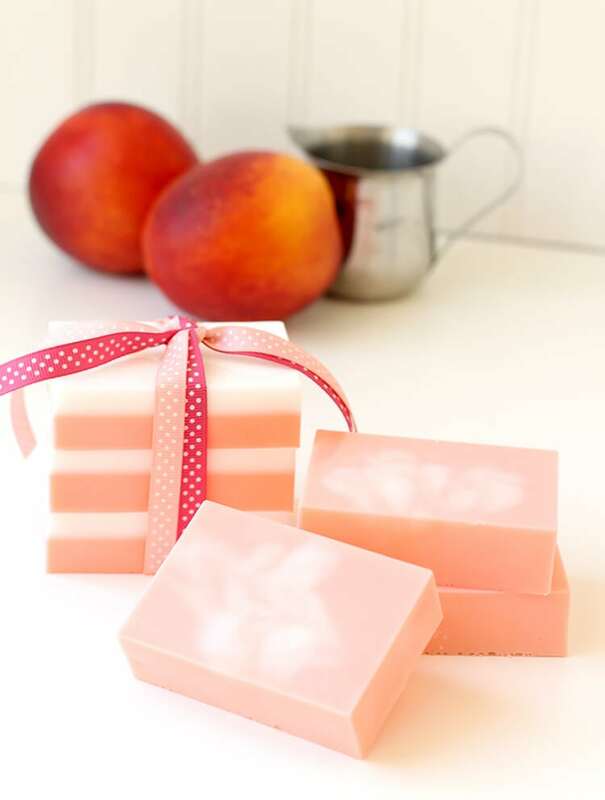 Does the peach essential oil keep its scent through the life of the soap?